It's a little known and completely unsubstantiated fact that in the early stages of Space Ghost design, artists at Hanna Barbera conceived the superhero as a chicken. 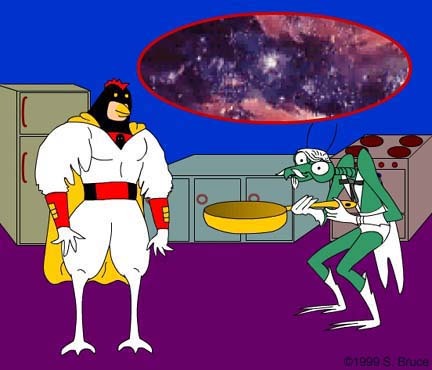 In the only known production painting, obtained for this Web page at great expense and personal risk, Space Ghost Chicken faces his arch nemesis Colonel Zorak, who brandishes his deadly space skillet. Hanna Barbera producers abandoned the concept due to the perceived implausibility of a chicken superhero. Little did they know that Super Chicken was about to forever change the way the world views animated poultry.